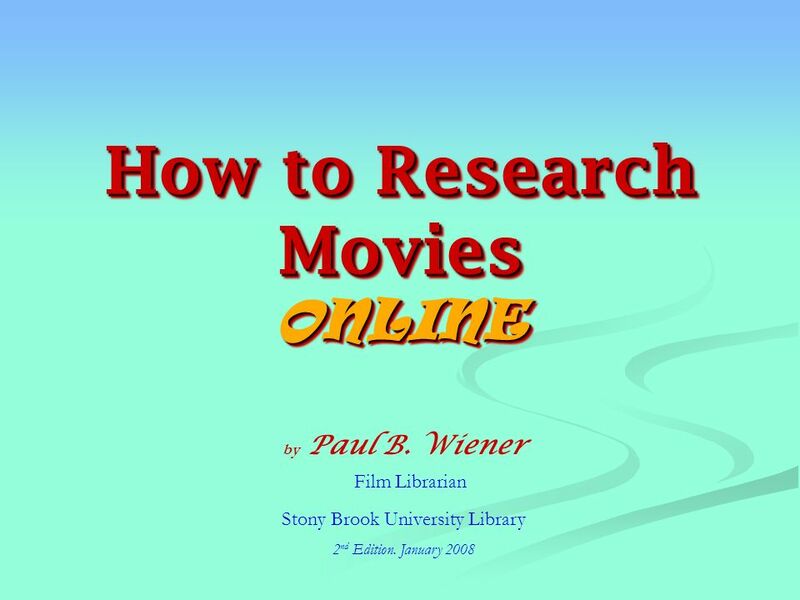 How to Research Movies ONLINE by Paul B. Wiener Film Librarian Stony Brook University Library 2 nd Edition. January 2008. 3 We treat movies like history, like facts. Do movies really happen? Are they really illusions? Can a movie quote another movie? Can an actor create a character? Does a character ever do anything? When writing about movies, what can we say that is more than our opinion? Movies can be studied like every other phenomenon. There are hundreds of ways to discuss them. 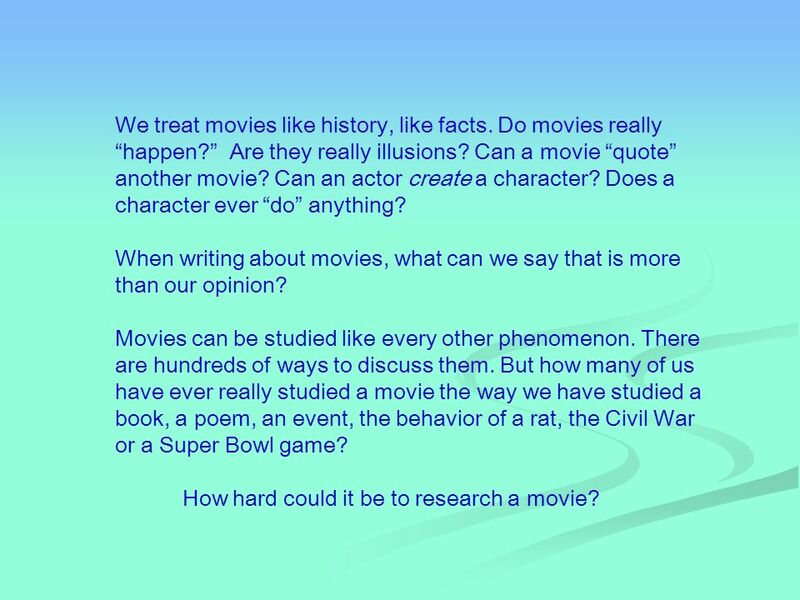 But how many of us have ever really studied a movie the way we have studied a book, a poem, an event, the behavior of a rat, the Civil War or a Super Bowl game? How hard could it be to research a movie? 4 Its not hard at all. Almost everyone has an opinion or an observation about a particular movie, and many have written them down. Some do it for a living. Research is finding what theyve written and using it to help us think or act. 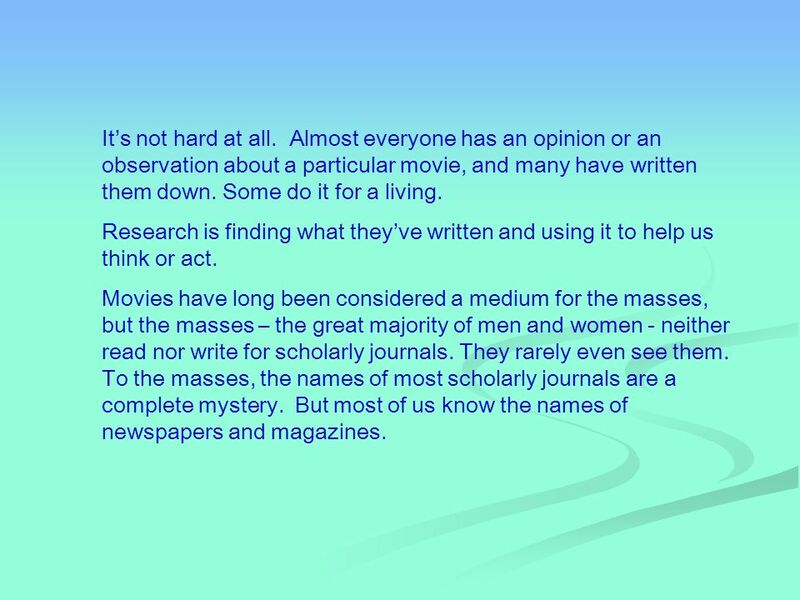 Movies have long been considered a medium for the masses, but the masses – the great majority of men and women - neither read nor write for scholarly journals. They rarely even see them. To the masses, the names of most scholarly journals are a complete mystery. But most of us know the names of newspapers and magazines. 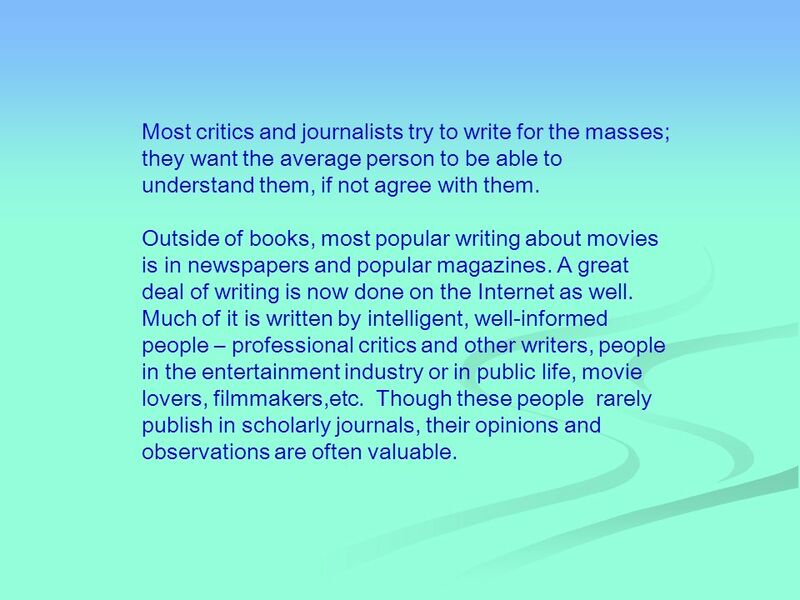 5 Most critics and journalists try to write for the masses; they want the average person to be able to understand them, if not agree with them. Outside of books, most popular writing about movies is in newspapers and popular magazines. A great deal of writing is now done on the Internet as well. Much of it is written by intelligent, well-informed people – professional critics and other writers, people in the entertainment industry or in public life, movie lovers, filmmakers,etc. Though these people rarely publish in scholarly journals, their opinions and observations are often valuable. 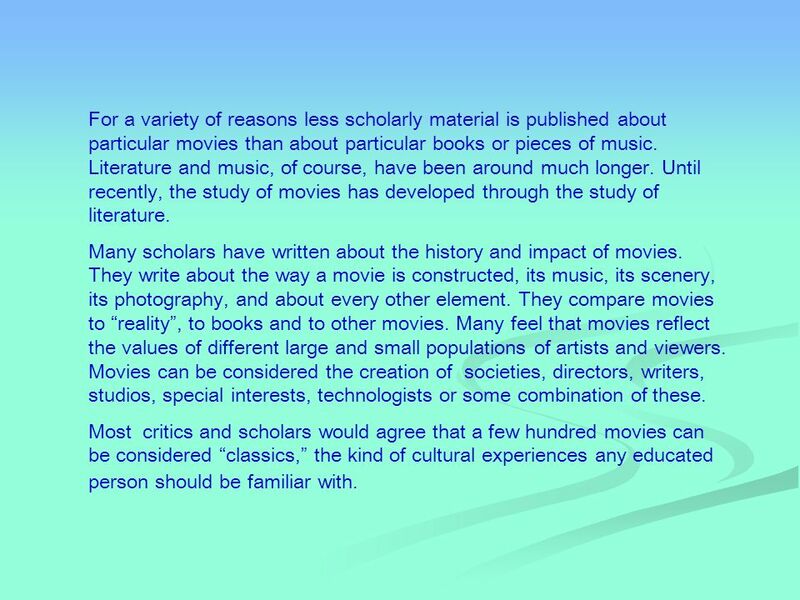 6 For a variety of reasons less scholarly material is published about particular movies than about particular books or pieces of music. Literature and music, of course, have been around much longer. Until recently, the study of movies has developed through the study of literature. Many scholars have written about the history and impact of movies. 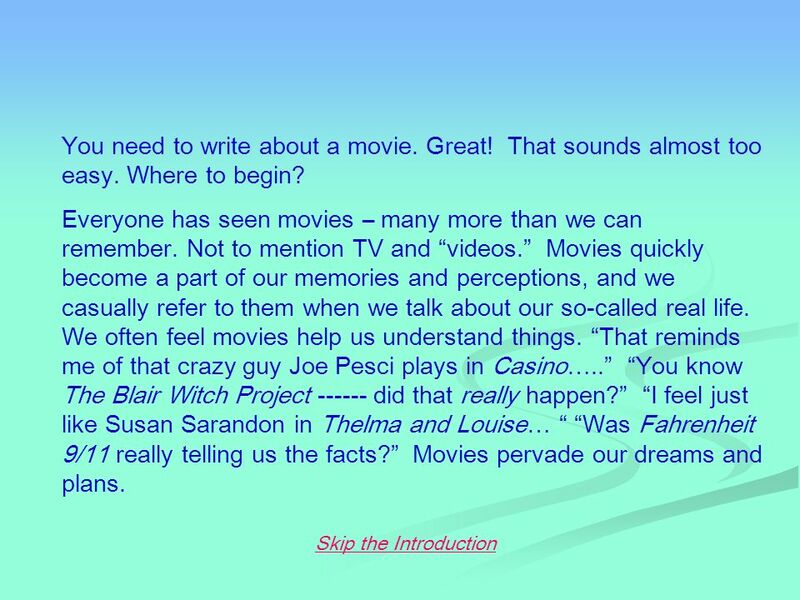 They write about the way a movie is constructed, its music, its scenery, its photography, and about every other element. They compare movies to reality, to books and to other movies. Many feel that movies reflect the values of different large and small populations of artists and viewers. Movies can be considered the creation of societies, directors, writers, studios, special interests, technologists or some combination of these. Most critics and scholars would agree that a few hundred movies can be considered classics, the kind of cultural experiences any educated person should be familiar with. 7 Where you start your research – either about movies in general or about specific movies – will depend on your assignment, on what kind movie it is, on what other topics youre discussing in your paper, and on what point youre trying to make. 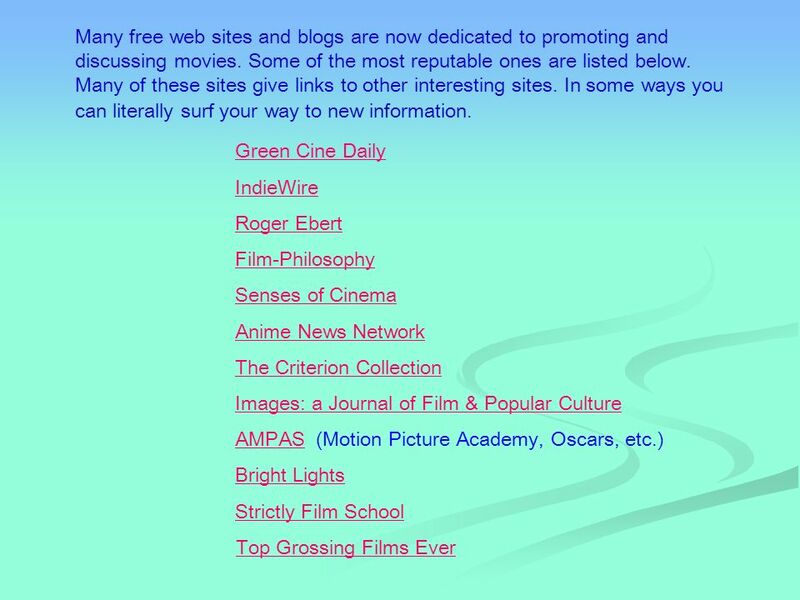 There are scholarly resources about movies. Many are in the Library. Some are online. 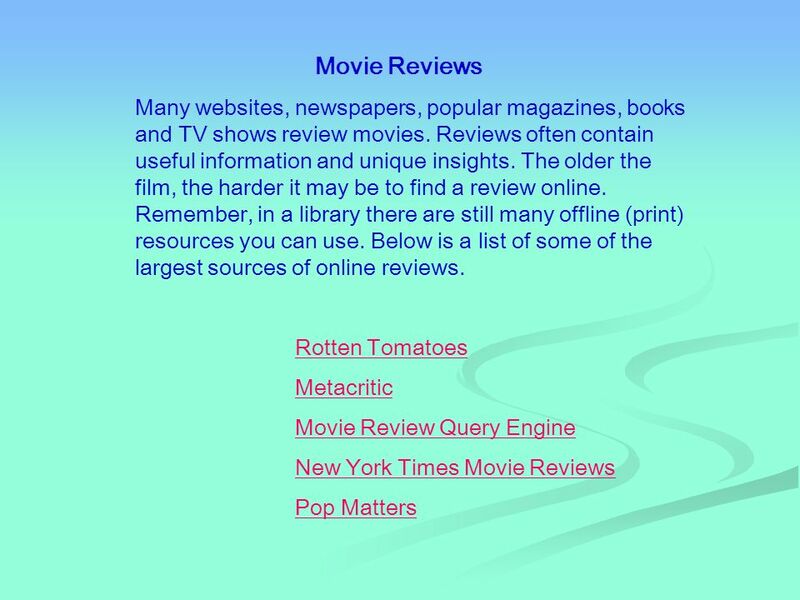 In fact, it can be difficult to find scholarly or non-scholarly information about movies without using the Library. 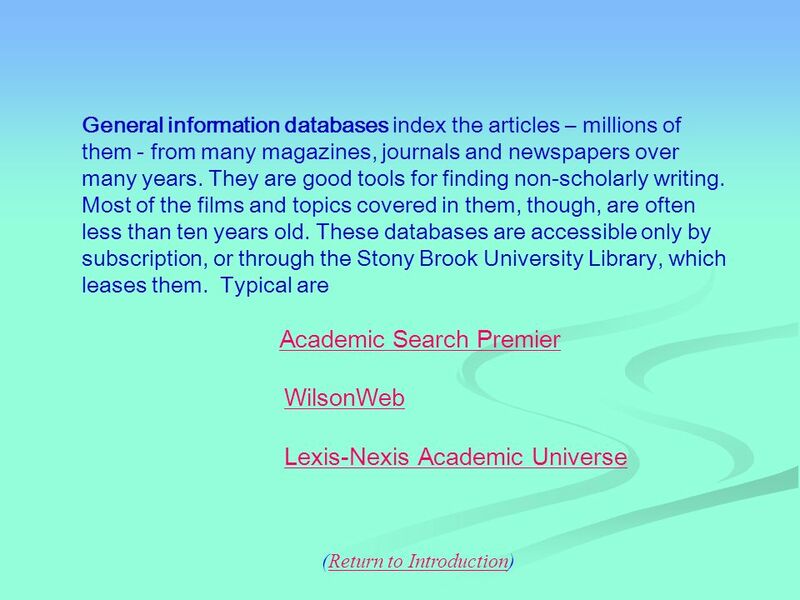 Indexes, or databases, provided by libraries, can guide you quickly to collections of articles and information sources. 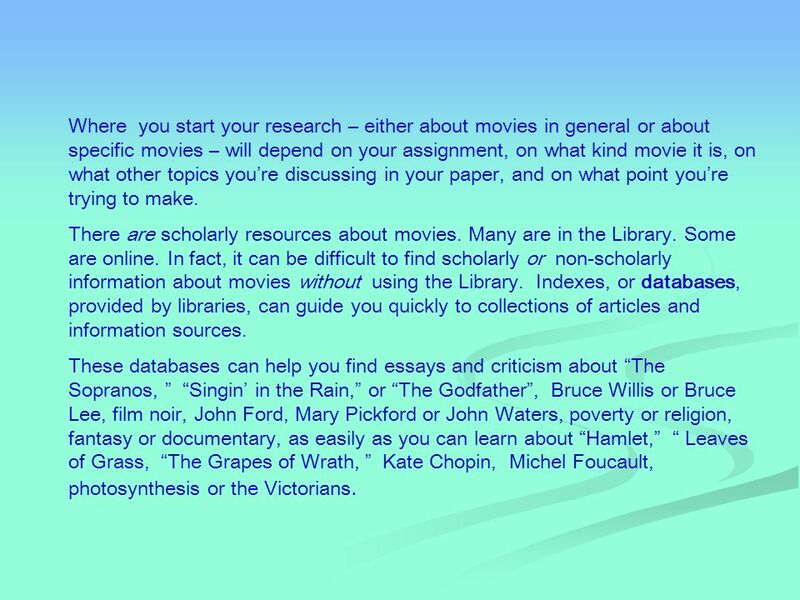 These databases can help you find essays and criticism about The Sopranos, Singin in the Rain, or The Godfather, Bruce Willis or Bruce Lee, film noir, John Ford, Mary Pickford or John Waters, poverty or religion, fantasy or documentary, as easily as you can learn about Hamlet, Leaves of Grass, The Grapes of Wrath, Kate Chopin, Michel Foucault, photosynthesis or the Victorians. 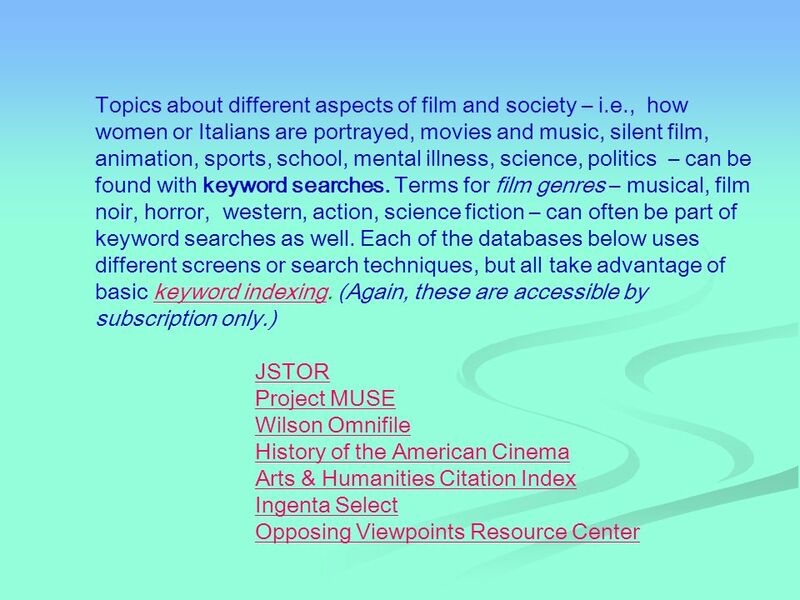 10 Other databases provide more scholarly articles about movies - writing by professors, experts and professionals in film studies or film production - that are published in journals edited and read by specialists in the field. 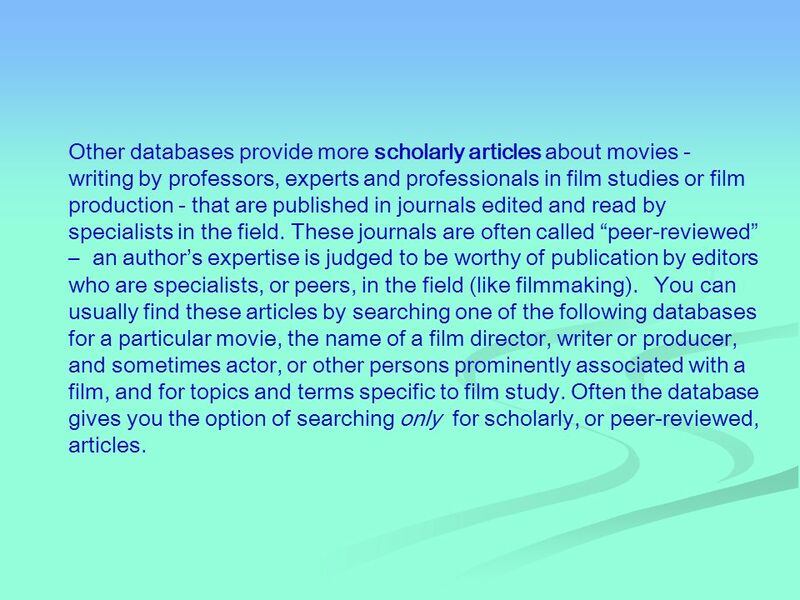 These journals are often called peer-reviewed – an authors expertise is judged to be worthy of publication by editors who are specialists, or peers, in the field (like filmmaking). 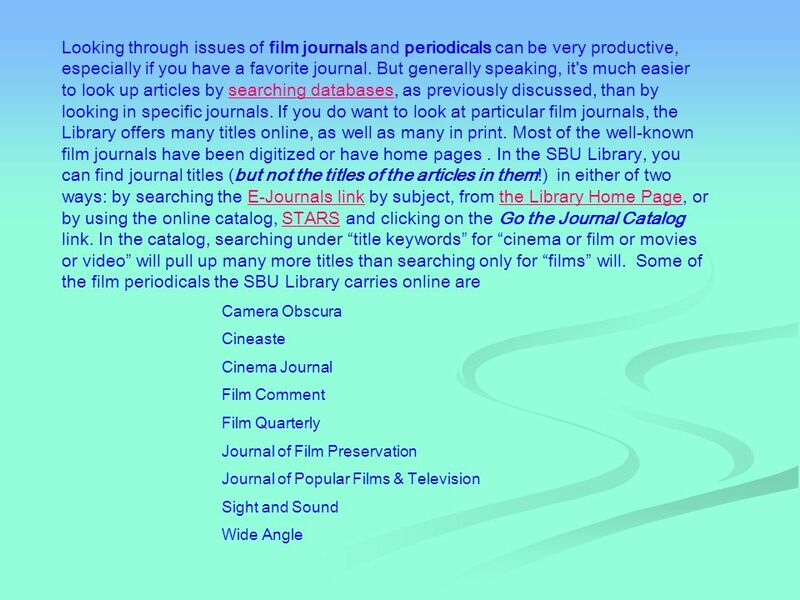 You can usually find these articles by searching one of the following databases for a particular movie, the name of a film director, writer or producer, and sometimes actor, or other persons prominently associated with a film, and for topics and terms specific to film study. 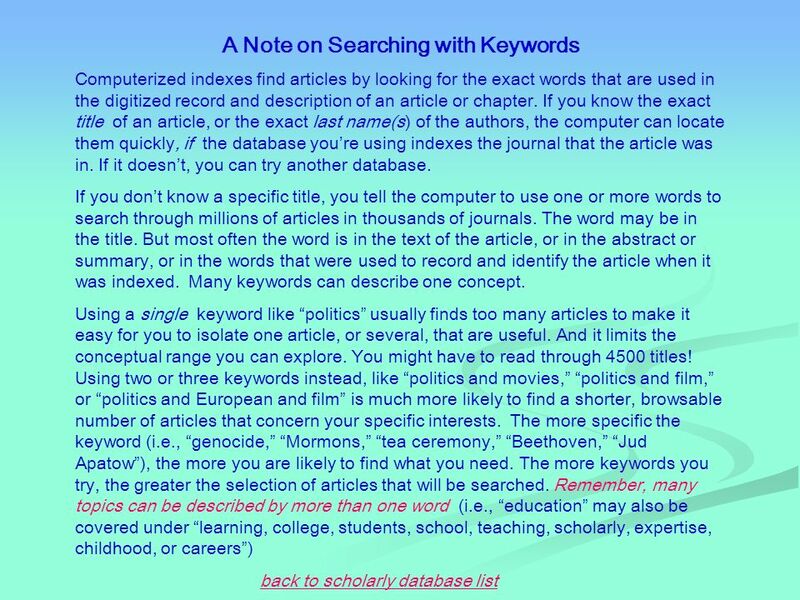 Often the database gives you the option of searching only for scholarly, or peer-reviewed, articles. 19 Film Scripts Except for a few hundred classic films published in book form, it can be very difficult to find accurate film scripts for free, even in libraries. Most film scripts are either unpublished, expensive collectors items or unauthorized drafts. 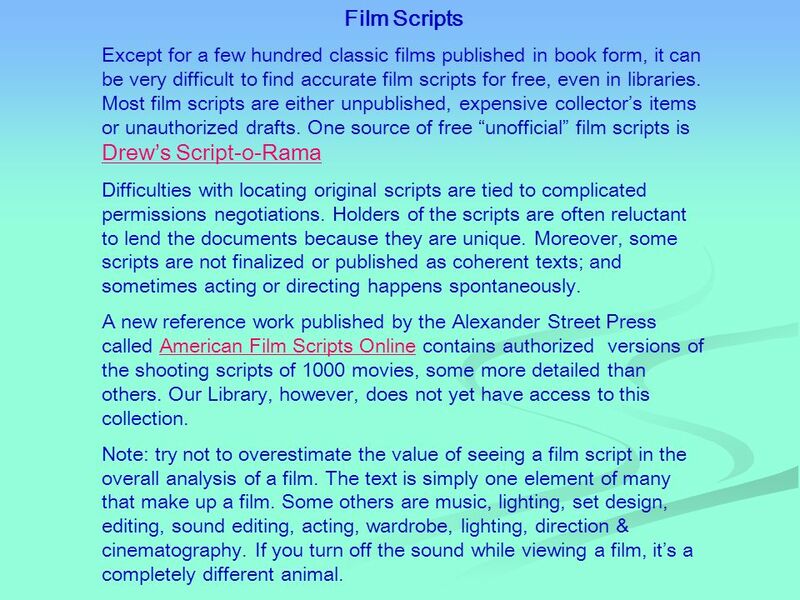 One source of free unofficial film scripts is Drews Script-o-Rama Drews Script-o-Rama Difficulties with locating original scripts are tied to complicated permissions negotiations. Holders of the scripts are often reluctant to lend the documents because they are unique. Moreover, some scripts are not finalized or published as coherent texts; and sometimes acting or directing happens spontaneously. 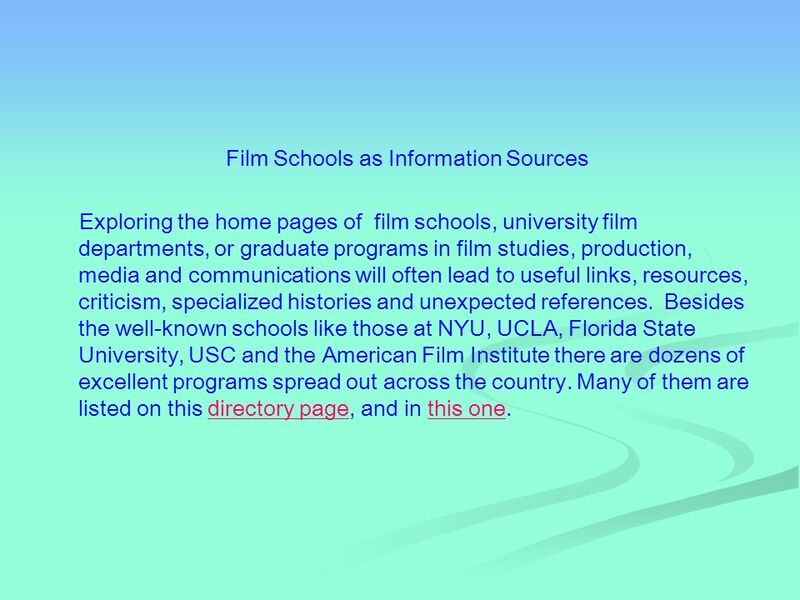 A new reference work published by the Alexander Street Press called American Film Scripts Online contains authorized versions of the shooting scripts of 1000 movies, some more detailed than others. 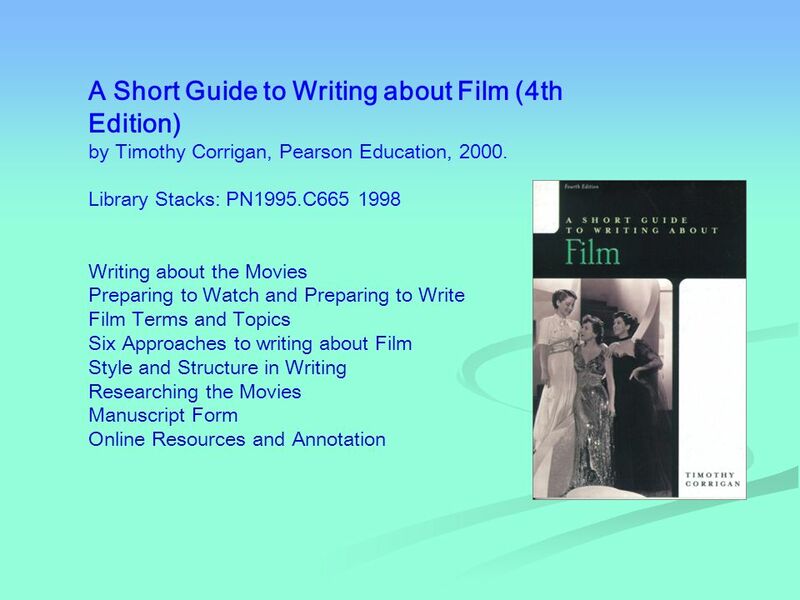 Our Library, however, does not yet have access to this collection.American Film Scripts Online Note: try not to overestimate the value of seeing a film script in the overall analysis of a film. The text is simply one element of many that make up a film. Some others are music, lighting, set design, editing, sound editing, acting, wardrobe, lighting, direction & cinematography. If you turn off the sound while viewing a film, its a completely different animal. 23 Its time to admit what we all suspected: not everything can be found online. 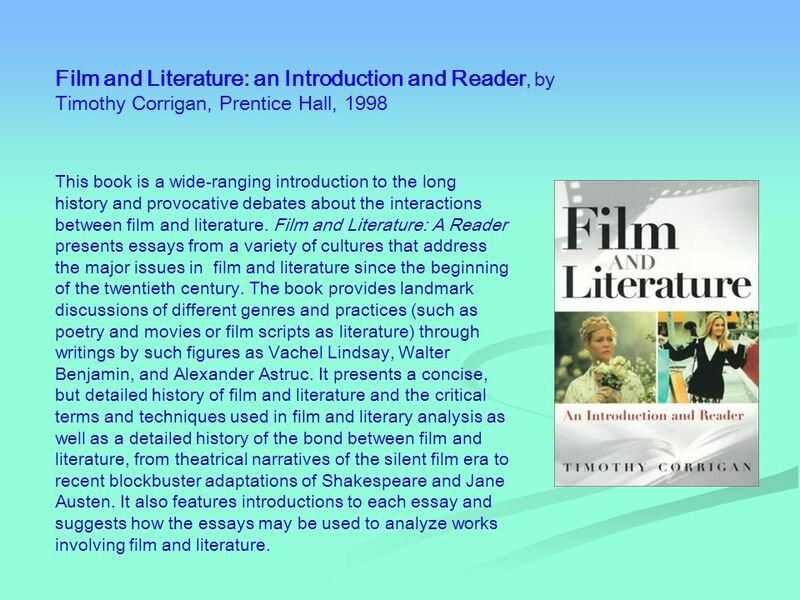 There are still many books and essays by film scholars and critics to examine, without which the area of film studies would never have developed. 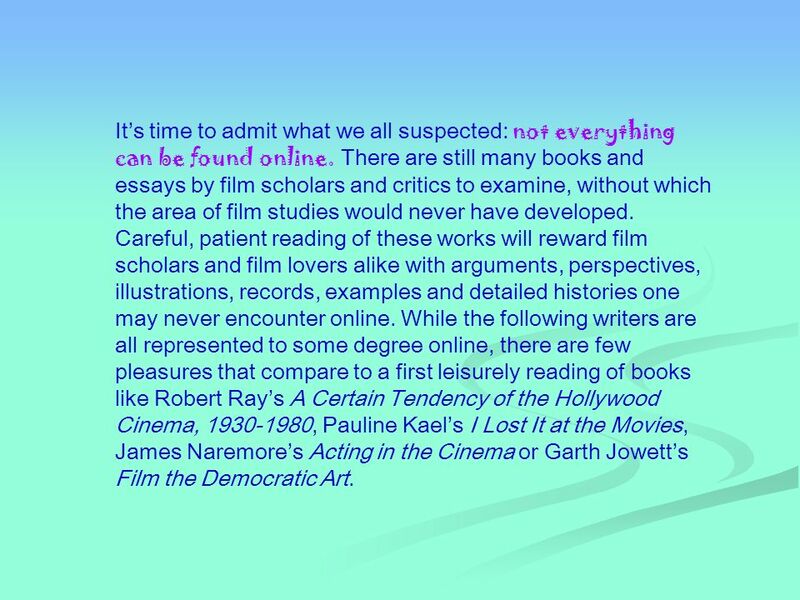 Careful, patient reading of these works will reward film scholars and film lovers alike with arguments, perspectives, illustrations, records, examples and detailed histories one may never encounter online. While the following writers are all represented to some degree online, there are few pleasures that compare to a first leisurely reading of books like Robert Rays A Certain Tendency of the Hollywood Cinema, 1930-1980, Pauline Kaels I Lost It at the Movies, James Naremores Acting in the Cinema or Garth Jowetts Film the Democratic Art. 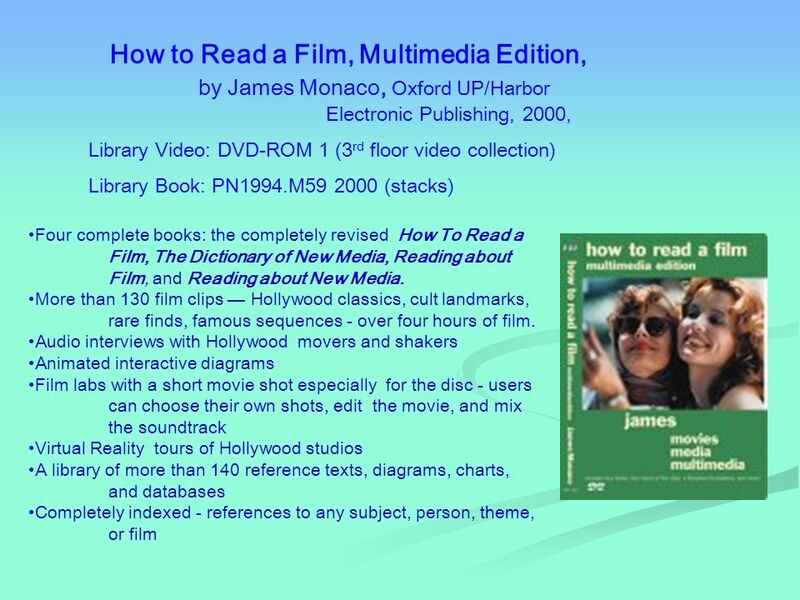 25 BEYOND ONLINE The following slides show several of the key reference books that cover the broad range of Film Studies. All are in the Library. The Cinema Arts Center in Huntington is the leading film organization in Suffolk Country (about a 25-minute drive from the SBU campus), and one of the best in the country. It shows art films, old films, foreign films and unusual films. It also sponsors lectures, courses and film-related social events. 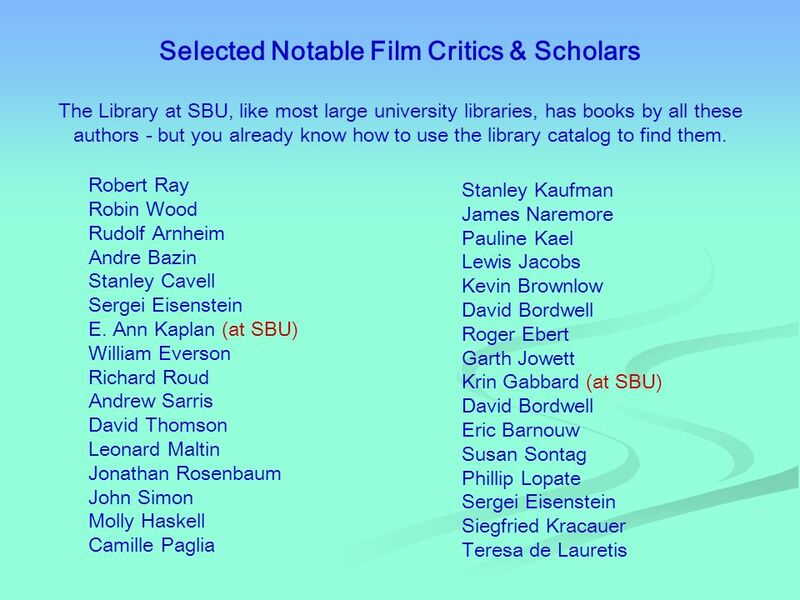 For Stony Brook students and film lovers the CAC is a rare and dynamic resource for film study. Membership is available. 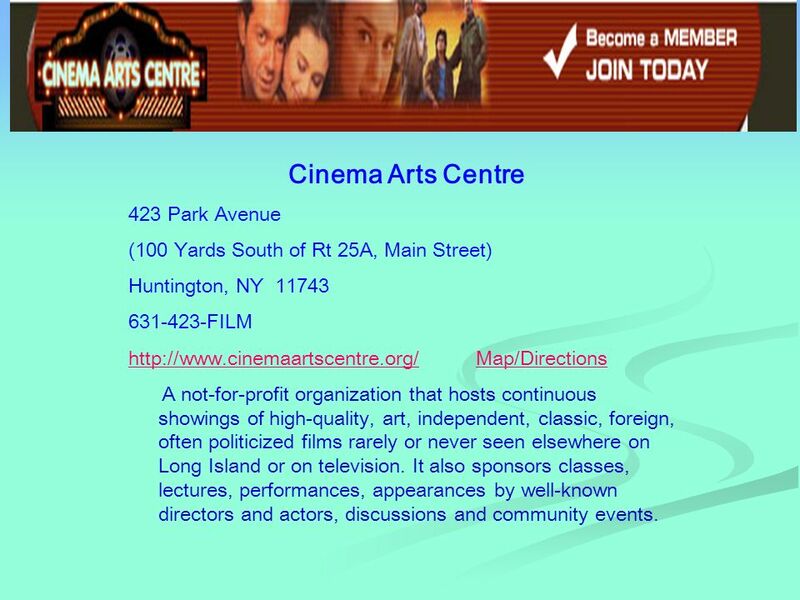 26 Cinema Arts Centre 423 Park Avenue (100 Yards South of Rt 25A, Main Street) Huntington, NY 11743 631-423-FILM http://www.cinemaartscentre.org/http://www.cinemaartscentre.org/ Map/DirectionsMap/Directions A not-for-profit organization that hosts continuous showings of high-quality, art, independent, classic, foreign, often politicized films rarely or never seen elsewhere on Long Island or on television. It also sponsors classes, lectures, performances, appearances by well-known directors and actors, discussions and community events. 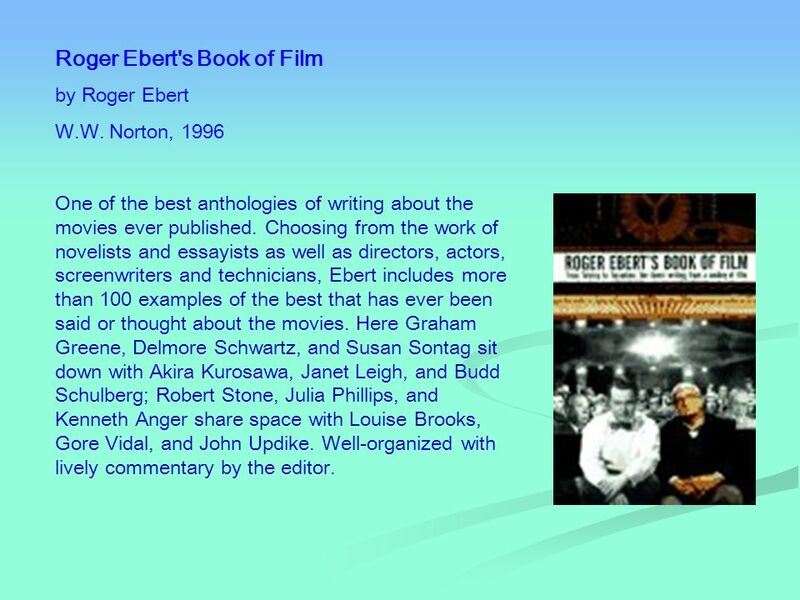 30 Roger Ebert's Book of Film by Roger Ebert W.W. Norton, 1996 One of the best anthologies of writing about the movies ever published. Choosing from the work of novelists and essayists as well as directors, actors, screenwriters and technicians, Ebert includes more than 100 examples of the best that has ever been said or thought about the movies. Here Graham Greene, Delmore Schwartz, and Susan Sontag sit down with Akira Kurosawa, Janet Leigh, and Budd Schulberg; Robert Stone, Julia Phillips, and Kenneth Anger share space with Louise Brooks, Gore Vidal, and John Updike. Well-organized with lively commentary by the editor. 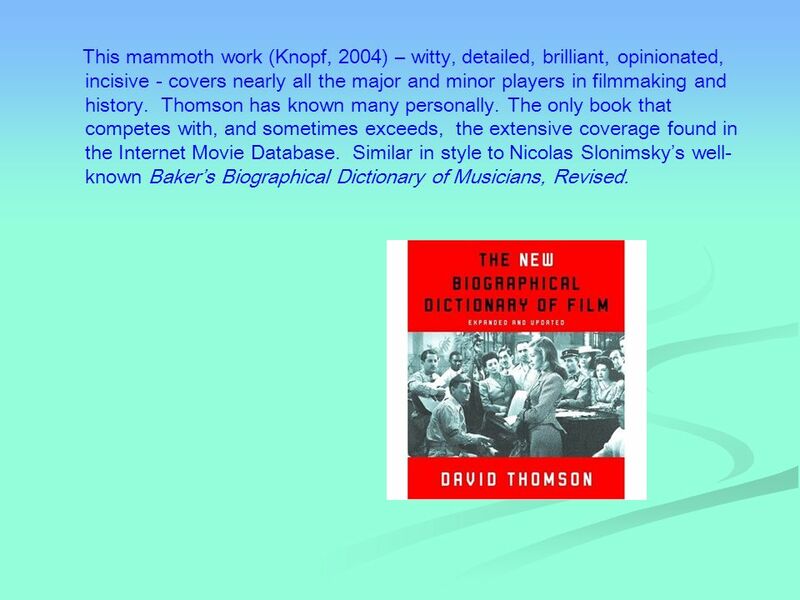 32 This mammoth work (Knopf, 2004) – witty, detailed, brilliant, opinionated, incisive - covers nearly all the major and minor players in filmmaking and history. Thomson has known many personally. 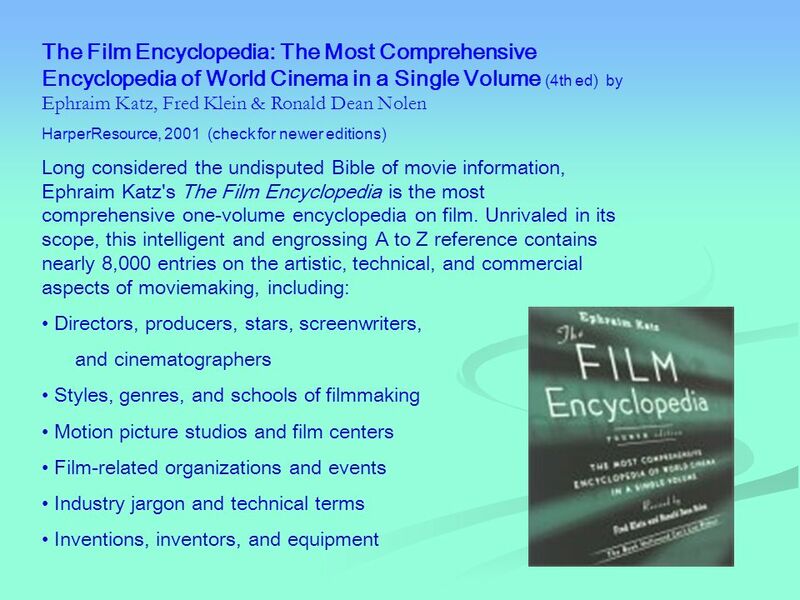 The only book that competes with, and sometimes exceeds, the extensive coverage found in the Internet Movie Database. Similar in style to Nicolas Slonimskys well- known Bakers Biographical Dictionary of Musicians, Revised. 33 When you have read all the studies, criticism, history, searched the entire Web, checked out all the links, blogs, books, databases and digitized archives, and youre still not sure if you really know what you watched, can you anything more? 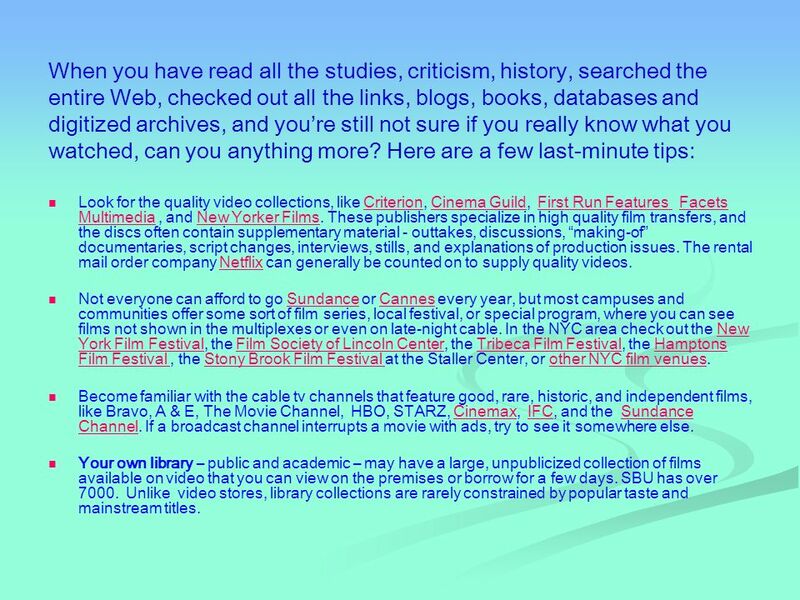 Here are a few last-minute tips: Look for the quality video collections, like Criterion, Cinema Guild, First Run Features Facets Multimedia, and New Yorker Films. These publishers specialize in high quality film transfers, and the discs often contain supplementary material - outtakes, discussions, making-of documentaries, script changes, interviews, stills, and explanations of production issues. The rental mail order company Netflix can generally be counted on to supply quality videos.CriterionCinema GuildFirst Run Features Facets MultimediaNew Yorker FilmsNetflix Not everyone can afford to go Sundance or Cannes every year, but most campuses and communities offer some sort of film series, local festival, or special program, where you can see films not shown in the multiplexes or even on late-night cable. In the NYC area check out the New York Film Festival, the Film Society of Lincoln Center, the Tribeca Film Festival, the Hamptons Film Festival, the Stony Brook Film Festival at the Staller Center, or other NYC film venues.SundanceCannesNew York Film FestivalFilm Society of Lincoln CenterTribeca Film FestivalHamptons Film Festival Stony Brook Film Festival other NYC film venues Become familiar with the cable tv channels that feature good, rare, historic, and independent films, like Bravo, A & E, The Movie Channel, HBO, STARZ, Cinemax, IFC, and the Sundance Channel. If a broadcast channel interrupts a movie with ads, try to see it somewhere else.CinemaxIFCSundance Channel Your own library – public and academic – may have a large, unpublicized collection of films available on video that you can view on the premises or borrow for a few days. SBU has over 7000. Unlike video stores, library collections are rarely constrained by popular taste and mainstream titles. 34 Digital awareness There can be no question that digital technology has revolutionized film study. 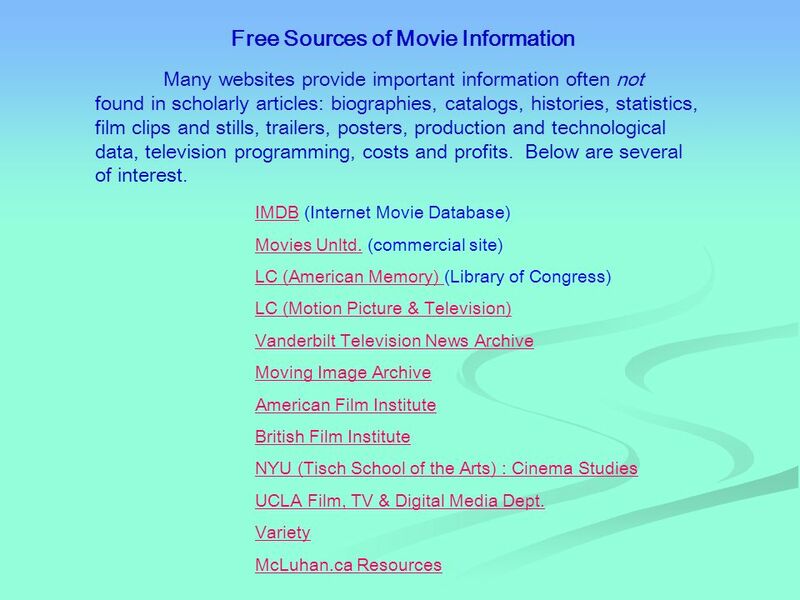 Not only is researching film - in libraries, indexes, archives, on websites and blogs - easier and faster, but the way movies are viewed now make it possible to index movies - to stop action, frame by frame, if necessary - and retrieve scenes by number, keywords and other emerging tags (metadata). Playback controls can enhance stills and scenes. You can take movies with you and view them almost anywhere. Critical analyses and papers can be written, published, and sent online with illustrative examples embedded in them as files and URLs. Key scenes can be re-edited, re-imagined, compared, compiled and identified (by genre, actor, length, lighting, music, date, effects, color, and a hundred other factors). In only a few years many of these films will be available online, downloadable, or stored in new micromedia. Youll be able to study them online, or label, annotate, cut and paste from them (YouTube already makes this possible). Youll be able to watch in ways even the filmmakers themselves couldnt have imagined. 35 Now, if youre still uncertain about what your movie is all about, watch it again. And then again. No movie can truly be seen after only one viewing. Slow down your vision. Look for the details and remember them. Take notes. Watch the way movies make time pass in a world where matter doesnt matter. Now, if youre still uncertain about what your movie is all about, watch it again. And then again. No movie can truly be seen after only one viewing. Slow down your vision. Look for the details and remember them. Take notes. 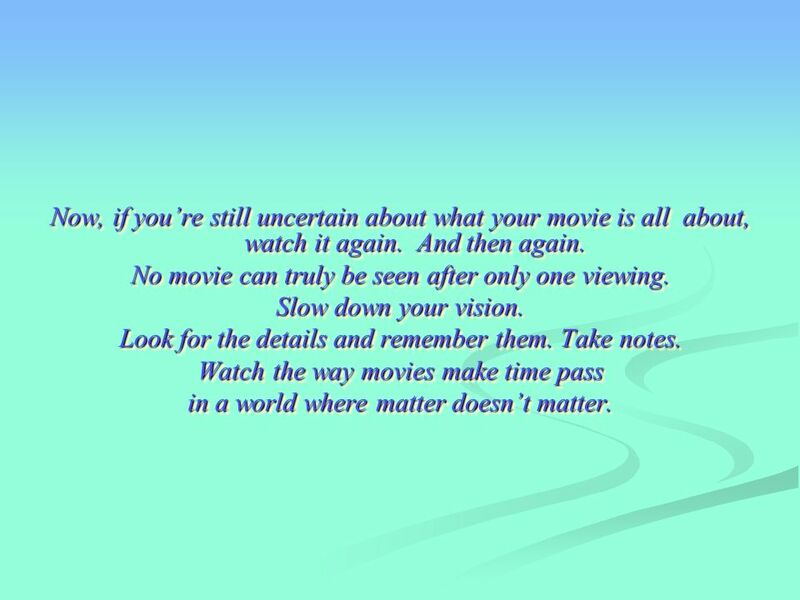 Watch the way movies make time pass in a world where matter doesnt matter. 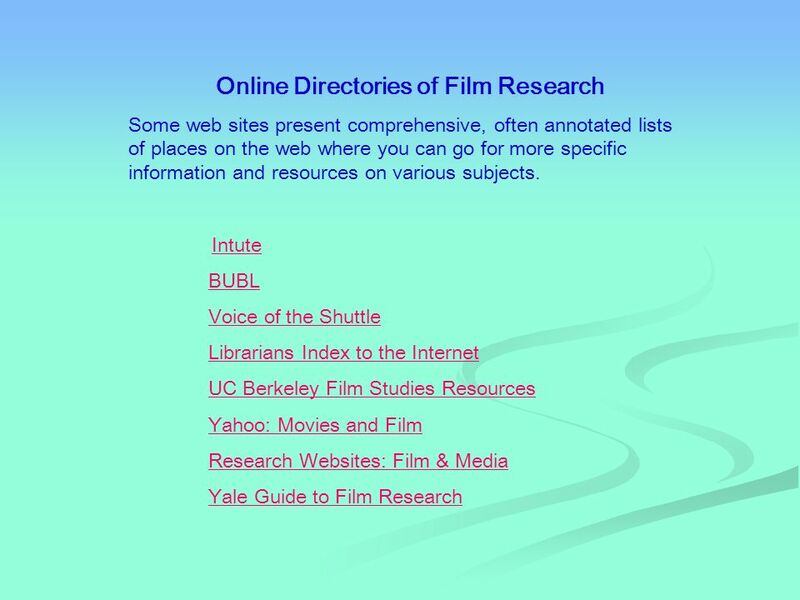 Download ppt "How to Research Movies ONLINE by Paul B. Wiener Film Librarian Stony Brook University Library 2 nd Edition. January 2008." 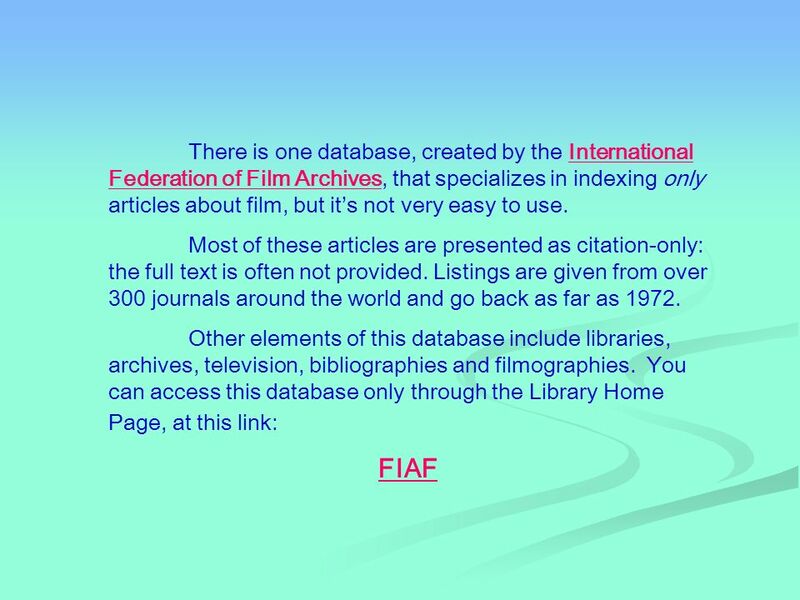 The Databases: An Overview When this image appears, click to proceed to the next slide at your own pace. To go back, click the right mouse button and select. This PowerPoint presentation and handouts are posted under “Library Classes” on library website. Basic Research Skills M. Holt SHS Librarian. 1 SUBJECT DATABASES ENGLISH 115 Hudson Valley Community College Marvin Library Learning Commons. English 080 out-search, out-cite, out-last Michelle Ward, Sep 2008 Okanagan College Kelowna, Library Library Survivor Okanagan. Copyright © Allyn & Bacon 2009 Public Speaking: An Audience-Centered Approach – 7 th edition Chapter 7 Gathering Supporting Material This multimedia product. Finding & Evaluating Sources Using the Hinkle Library web page. Starting Your Research Library Instruction Summer 2003. Finding Books in the Library Catalog CARSON-NEWMAN COLLEGE. 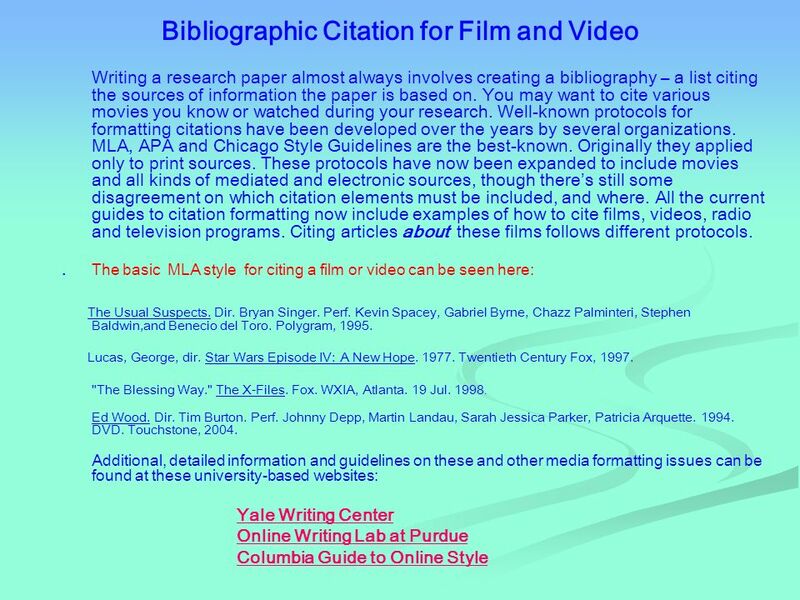 How to Prepare an Annotated Bibliography Lynn Lampert. 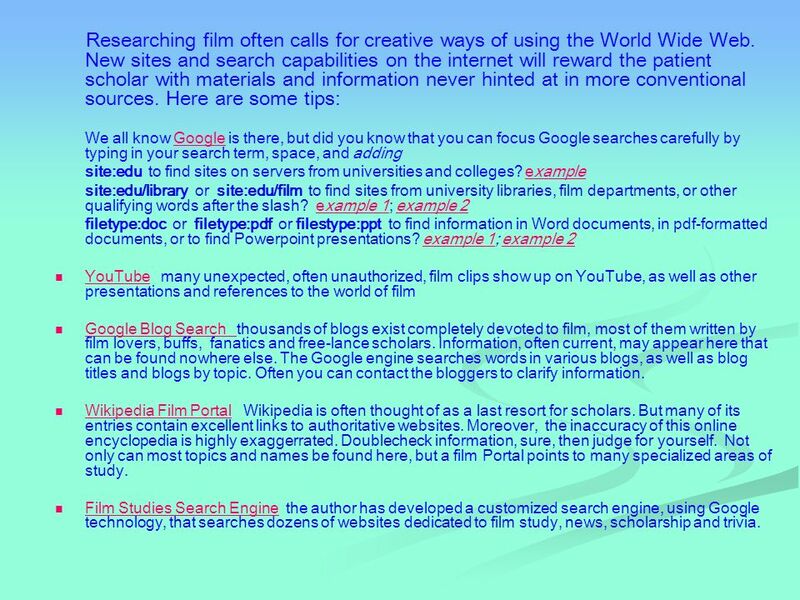 Copyright © Allyn & Bacon (2007) Conducting Library Research Graziano and Raulin Research Methods: Appendix C This multimedia product and its contents. Welcome to a guided tour of Oxford African American Studies Center. Please click the forward arrows to advance to the next section or click on a topic. Library HITS Helpful Information for Trinity Students/Staff Library eResources for Languages & Literatures Michaelmas Term 2013 Trinity College Library. Internet Research Finding Free and Fee-based Obituaries Online. 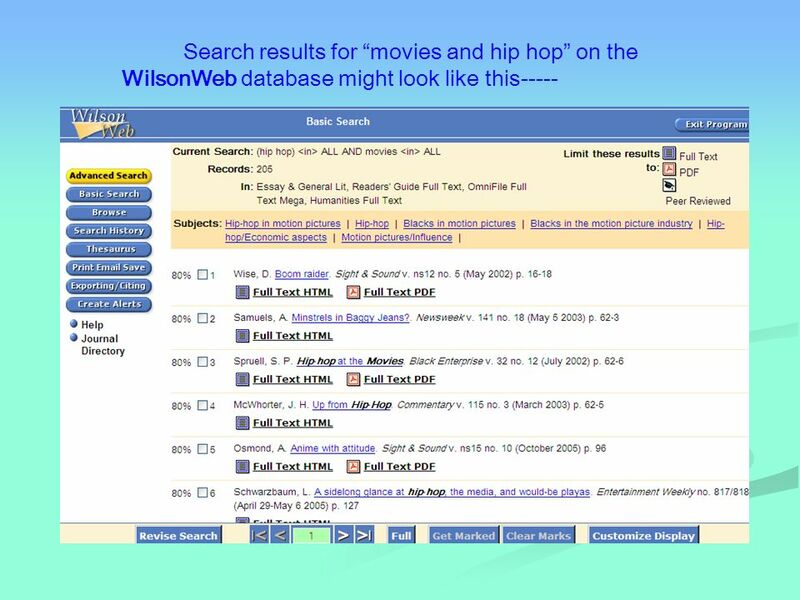 English 012 Library Info Skills: Session 2 Searching for Articles & Web Sites Michelle Ward, October 2006 Okanagan College Penticton, Library www.okanagan.bc.ca/library.